West Indies allrounder Kieron Pollard may not have been in the best of form with the bat in the ongoing season of the IPL but his fielding and catching certainly have remained pretty much top notch. 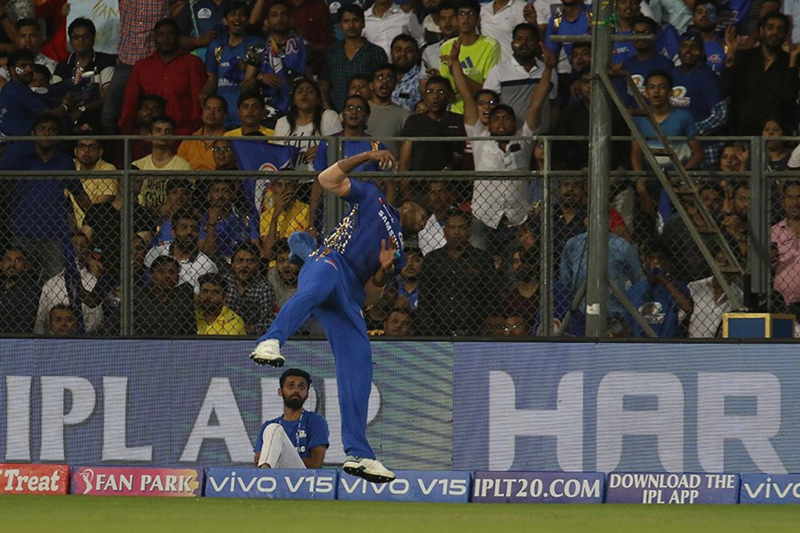 Pollard pulled off one of the best catches in IPL history to dismiss Suresh Raina in the tie against defending champions Chennai Super Kings at the Wankhede Stadium in Mumbai on Wednesday. It was in the last ball of the fifth over of the Chennai Super kings innings when Jason Behrendorff bowled it short and wide inviting the left hander to go for the shot. Raina, who had already smashed a couple of boundaries in the over, fell for the trap and slashed it on the up over sweeper cover where Pollard had been positioned a few moments back. The ball seemed to be sailing over the boundary but Kieron Pollard timed his jump to perfection and to complete the catch. t wasn’t an easy opportunity by any means and the acrobatic effort from the 31 year old left everyone in the stadium including Suresh Raina stunned to disbelief. Kieron Pollard, earlier, had a good outing with the bat as he scored 17 off just 7 balls with a six in the final over to guide Mumbai Indians to a competitive total of 170/5. Sent into bat, Suryakumar Yadav compiled a half century to lay the foundation for Mumbai Indians at the Wankhede Stadium before Hardik’s eight-ball 25 and Pollard’s seven-ball 17 made sure the hosts ended their innings on a high adding 45 runs off the last 2 overs.